Blindfolds can be used to prevent a player from viewing the board. This is great for games where people need to “close their eyes”. To easily use the blindfold, just press the “B” key or right click on a non-object to bring up the Global Contextual Menu and choose Blindfold. ◘ A player wearing a blindfold can’t see anything but a button to remove the blindfold, the chat and other UI elements. ◘ When a player puts a blindfold on, they get a message informing them that they can no longer see blindfold messages for other players. ◘ It’s clearly marked who’s wearing a blindfold with an icon next to their name in the top right. ◘ The names list are hidden when you are blindfolded so that you cannot tell who else is blindfolded or not. 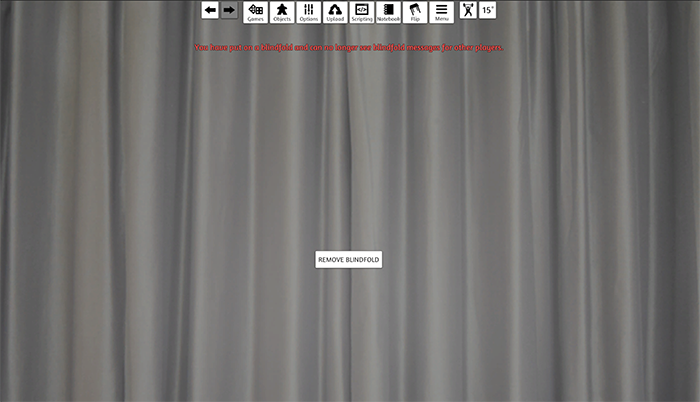 ◘ A curtain will drop down blocking the player’s view from the rest of the game. ◘ You can click the button to take off the Blindfold or press B again. ◘ The blindfold can be used in scripting. ◘ The blindfold also works in VR.